Wow, first card printed for Wild only! It's been pretty good in my mech decks. You know why isn´t played? Looks just like Robot Santa Claus from Futurama. Is it just me, or this gorilla actually is some protoss purifier unit with that awesome beard of Karax? 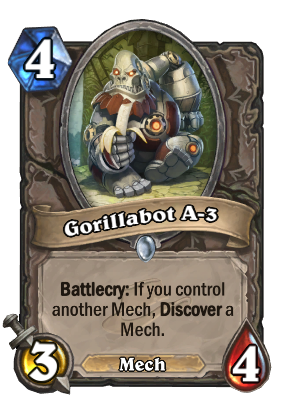 It's going to be depressing when formats come out and Gorillabot will only be able to discover five different mechs in Standard. Wow, you called it. I now have an itch to play this guy in a deck using the mechs from One Night. You know, along with murlocs, beasts and dragons along with The Curator and Zoobot. First time I played this card in my Mechrouge deck I got Mimiron's Head. If that isn't a sign from RNJesus, I don't know what is. I love running 2 of these in a Mech Mage deck. I think it can replace Arcane Intellect pretty well. Seeing such a strange mech in an adventure like this... You're filled with determination. Didn't quite understand the reference a few days ago, but then I recently played Undertale. *Gives you a random mech. What? Why? Worked great in my Mage Murloc-Dragon OTK Fatigue deck. Sounds more like a gnomes idea.